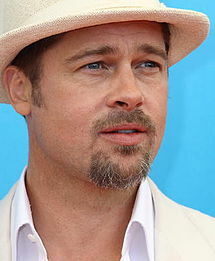 Movie star Brad Pitt recently stopped into the coffee shop I often visit, as I was enjoying a latte. Being as how I’ve already seen Brad Pitt in person twice, first, when he filmed a movie at my office and then again when he worked out at my gym, the experience was no big deal. However, I knew the ladies would be upset that they missed seeing this ‘Hollywood Hunk.’ Therefore, I kept the following journal, carefully detailing my experience so they would feel as if they were there. As you may have heard, Brad Pitt recently stopped by the coffee shop that I often patronize. I have to say, you didn’t miss much. First of all, he was wearing Daisy Dukes. Second of all, he came riding up to the café on a skateboard that he clearly did not know how to operate and when the board hit the curb he wiped out. And when he fell he tried to play it off by rolling over a couple of times and doing some crappy somersaults that took longer than they should have to execute and when he got up I could hear him say ‘aww yeah’ through the glass. When he walked in he had a big scrape on his knee and he wiped the blood off on some lady’s seeing-eye dog. Then Pitt ordered 17 boiling waters and shouted ‘drinks on the house!’ and he started throwing the cups of steaming water at people, and I don’t mean he tossed the cups, he whipped them. Then Pitt walked up to a girl who was doing homework on her laptop and said ‘answer’s B.’ Then he highlighted her entire essay, hit delete, pressed the ‘b’ button and hit save. When the barista pointed out to Pitt that he wasn’t in ‘White Men Can’t Jump,’ Pitt grabbed him by the apron, took him outside, threw him into a taxi cab and ordered the driver to drive until he ran out of gas. Then he grabbed a megaphone and shouted ‘SHOCK AND AWE, HOSERS!” then dumped a bag of dried coffee grinds in a running fan before running out the door. I will say, however, that being in the same coffee shop with a big star like Brad Pitt was a cool experience. THis story seems a little far fetched!! I wish it was. I really do. Personally, I realize really big star actors, like Mr. Pitt, have to put up with packs of paparazzi’s and rarely can just to be themselves without everyone making a fuss…….but, what I saw with my own eyes is no excuse for dealing with celebrity stress. Hell, I think I read some place that he is actually a vegan!! If that is true……I betcha he spit that mouthful of ground meat out and didn’t give a dam if littering the street with spit n’pork was acceptable behavior. Well, its not! Whenever someone famous or rich comes to our coffee shop downtown, everyone pretends it’s not a big deal, secretly staring that them.